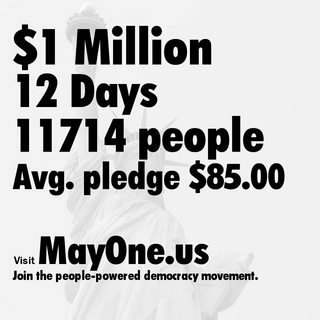 Mayday Citizens Superpac stories at Techdirt. stories filed under: "mayday citizens superpac"
The project already completed its first phase, raising $1-million and securing another million in matching funds, and now it's partway through the second, which has a goal of $5-million (and another $5-million to match). With two weeks left to go, it's got some distance to make up, so now is the time to use your money to fight back against the corrosive influence of money in politics. It could be awesome.